Exposed Architecture offers an overview of work by young architects in Latin America. 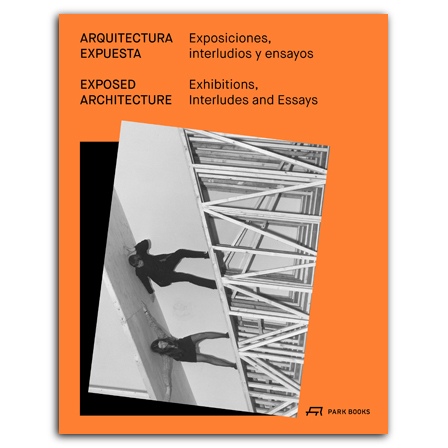 It is published in collaboration with LIGA – Space for Architecture in Mexico City. Founded in 2011, LIGA is an independent initiative for the promotion of contemporary architecture in Latin America by staging exhibitions and conferences and by publishing books on selected topics. The book's first part documents twelve innovative exhibitions created between 2013 and 2016 by firms from Argentina, Brazil/Uruguay, Chile, Mexico, Peru, Venezuela, and from Portugal at LIGA’s exhibition space in Mexico in images and brief texts. The second part recounts twelve “Interludes”—public events such as lectures, installations, performances, or studio visits—that for an essential part of LIGA’s program, shedding light at practice and aesthetics in contemporary Latin American architecture. The third part comprises short essays by curators from a range of institutions. They offer individual perspectives of exhibiting architecture, which has become a self-contained disciplinary topic in recent years. Contributors include Agnaldo Farias, Barry Bergdoll, Carlos Minguez Carrasco, Daniel Fernández Pascual, Florencia Rodriguez, Anna Puigjaner and Jorge Munguia, Rory Hyde, Tina Dicarlo, and Wonne Ickx. They look at key aspects and topics against a backdrop of manifold difficulties and challenges the region poses for the production and communication of architecture. (* 1984), architect and director of LIGA in Mexico City since 2015. Following her studies in Madrid and Berlin, she has worked, among other firms, with SANAA in Tokyo and taught at the Faculty of Architecture and Urbanism, Escola da Cidade in São Paulo. She has also contributed to various magazines, such as Domus, Wallpaper, or Avery Review. (* 1980), is director and curator of Archivo Diseño y Arquitectura in Mexiko City. He has previously been founding editor of the Mexican edition of Domus magazine.